I am a trooper as in "What a trooper!" I am in an albergue in Arrés sharing a habitaciónes (a bedroom) with several other pilgrims, all men. The beds are all so close that if any one of the men snores I can probably reach over and give him a 'turn over and shush up' nudge. The washroom facilities are all shared too. There is no light in the shower so you have to leave the door open to shower so that you can find the taps, manoeuvre the shower hose and hold onto the soap. There is no heat (although I'm sure eight sleeping bodies in one room might warm it up). We did not see another pilgrim all day so I don't know where all these roommates have come from. But I am a trooper and I will 'keep calm and keep on keeping on'. We started out this morning at 7:10am with Chris and Greg, two men on a mission to see a mission or more accurately a monastery. 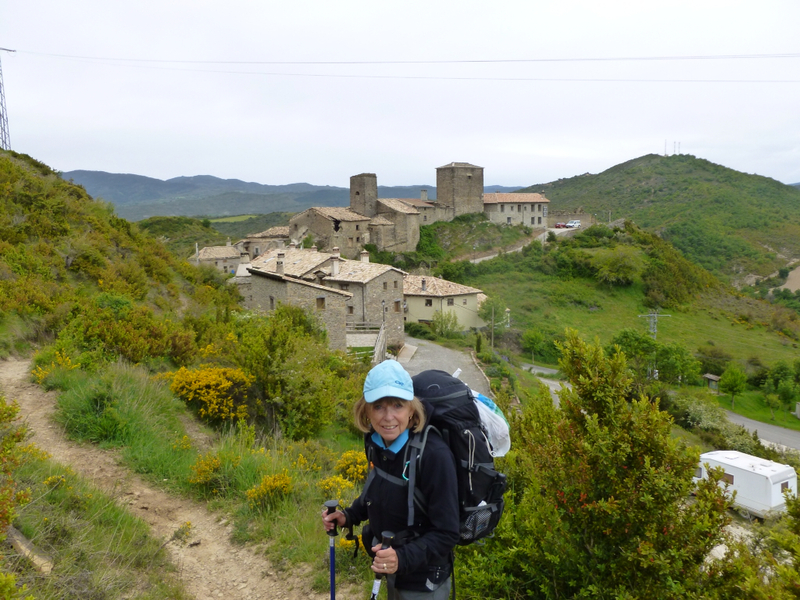 They had decided to add a seven kilometre detour to the Camino route in order to visit the Monastère de San Juan de la Peña so they were feeling they had no time to dawdle. The monastery they planned to visit sounded quite interesting. It was in fact comprised of two monasteries, one of which might have been a hermitage devoted to St. John the Baptist by some famous hermit, Juan de Atares. The monastery dates back to 1025 and was presented to the Cluniac Benedictines and became a starting point for the spread of the Order in Spain. This was also the first monastery to introduce the Latin Mass in Spain. Dayton and I decided to visit any site that is right on the Camino route, no detours, no side trips, especially not a seven kilometre detour two ways so we waved Chris and Greg goodbye as they headed into the highlands and we kept on the low route. The landscape has changed dramatically from the high, snow capped mountains to a low lying river valley, the Rio Aragone farming valley. The Camino way markers were very confusing and frustrating today. We'd see a marker stating 810kms to Santiago then 37 minutes later we'd see another marker 810 kms to Santiago and we were walking for all of those 37 minutes, not taking a break. We saw three 809 km markers about 15 minutes apart, then no 808 marker and again three 807 markers. I felt like I was standing still but I am a trooper so keep on keeping on. Dayton had another half yard long bocadillo break in Santa Cilia de Jaca and then we continued on to Puente la Reina. Now Puente la Reina is the name of the town at the end of our Camino Arles/ Aragone but once again someone has changed the goalposts. Our Puente la Reina is still a 30km a day, five day walk from here. No complaints. I am now in the walking zone. 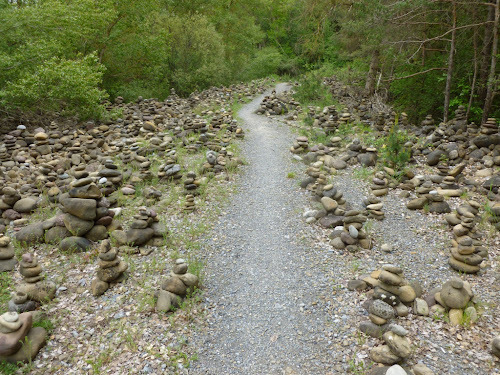 We did pass one interesting section where there were hundreds of stone pilgrim cairns like a stone fairy or pilgrim garden. Ten minutes after Puente la Reina, we reached the cut off for Arrés, our destination for this evening. 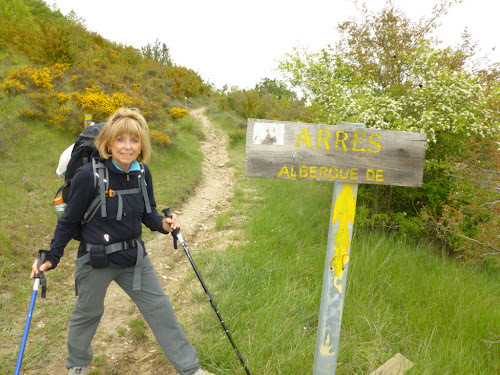 The sign to Arrés indicated 3.5kms but neglected to mention that it was 3.5 kms straight up - a muddy, mucky path. It certainly challenged my 'trooper' status. Aargh, there was a quite seething mental running commentary describing this path and I don't think I was the only one muttering and mumbling about the mud but the 'trooper' prevailed. There are a couple of blessings here; a bar/ restaurant that stays open and serves food and beverages (as in wine, beer and fries) all day. I will be a trooper. Maybe not. One our our albergue roomies, a guy from Italy, just came in to share a drink with us and he's already apologizing for being a very obnoxious snorer. I am a trooper. I am a trooper. I am a trooper. I will kill him. Only five more days. Perhaps the Italian snoring champion will fall out of step with you. That is unless he is already deceased. You and Dayton have done so well on this challenging Camino. Almost there. Best of luck. Oh boy.. you ARE a trooper! I'm not so good at shared facilities. Better yet.. you are a SAINT!